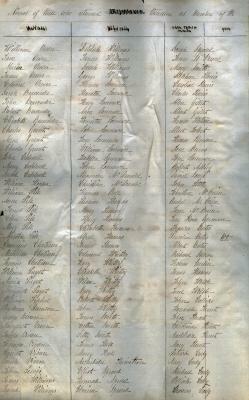 This item consists of 15 pages from the St. John's Anglican Church Parish Register which contain the 1852 census return for identified Anglicans in Whitby. This ledger belongs to the Archives at the Toronto Diocese of the Anglican Church of Canada. Questions and inquiries regarding reproductions should be directed there. This ledger belongs to the Archives of the Diocese of Toronto Anglican Church of Canada. Scanned by the Archives at Whitby Public Library for display on this website.